Written by: Priya Potapragada on March 29, 2017. Kogi State in central Nigeria sits on the confluence of the Niger and Benue rivers. Though the capital city of Lokoja is blessed by its proximity to the two great rivers and natural sources of water, the rest of the state is notorious for its dry, arid, and inhospitable environment – with a mean temperature of about 28 degrees celsius that rises significantly in the summer months and average annual rainfall of 29 inches. It is no surprise, that water scarcity in the region is considered one of the most imminent threats to daily life. Every day, millions of people across West Africa struggle to gain access to clean and safe drinking water. In Nigeria alone, over 57 million people have no choice but to access water from less-than sanitary sources. In the year 2015, water scarcity and poor sanitation led directly to roughly 73,000 deaths in the African nation. Access to water has long been a problem in sub-saharan Africa – the locations of boreholes have traditionally forced people far from their homes to acquire water. This brings with it an entire litany of problems, including the physical stress of carrying loads of water over long distances and the risk of assault that many girls and women face when travelling to remote areas to gather water. Time also becomes a factor, as it often leaves little time to pursue an education and care for pressing matters at home. One way to combat this has been to strategically place boreholes next to schools and populated centers in a concentrated effort to bring water to easily-walkable distances within the safety of the local communities. But even after the water is fetched, the litany of problems doesn’t end because the water is often polluted or contaminated, resulting in a need for proper sanitation methods. Poor sanitation is a leading cause of illness and death in Nigeria which can be remedied by the appropriate education of those utilizing boreholes as their main source(s) of water. The problem with sanitation is two-fold: education and maintenance. Education about the necessity of proper hygiene is an instrumental factor in reducing the number of diseases and deaths caused every year by illnesses such as dysentery. 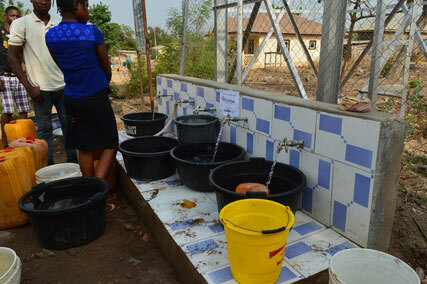 Using $115,000 in funds provided by CAF America on behalf of donors focused on providing safe access to clean water, Catholic Caritas Foundation of Nigeria was able to operate in the Nigerian state of Kogi and install and repair a number of water points, hand pumps, and solar-powered boreholes while training local artisans and forming and educating hygiene committees (WASHCOMs). Focusing on ten rural communities with a total population of more than five thousand, tangible outcomes of the project included the provision of clean, potable water and promotion of sanitation, health and hygiene awareness to these communities — which hitherto had very poor access to water and poor information on health and hygiene issues. Looking forward, Catholic Caritas Foundation of Nigeria aims to make clean water more accessible to rural communities in Nigeria while halting sickness and easily preventable injuries or deaths from dehydration and poor hygiene. Ultimately, this will involve the proper maintenance of the boreholes as well as a concentrated effort through hygiene committees to educate the communities at large on proper sanitation and health. If you’d like to support water access and sanitation education efforts in the Kogi region, please donate here.